These beeswax candles are perfect for handmade Valentine gifts, birthdays, and Hanukkah celebrations. No melting wax required! These are so simple and quick to make. 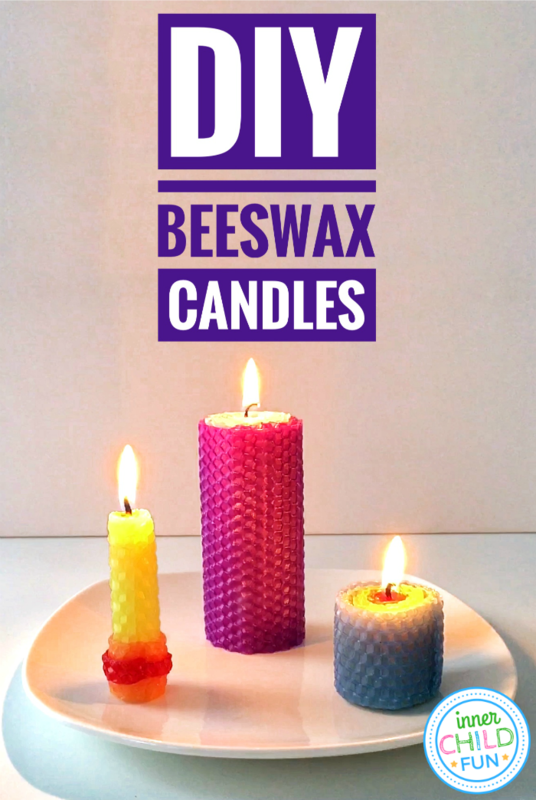 Below you will find a tutorial and short video showing step-by-step instructions to make your own beeswax candles from sheets. First, cut a wick about 1 cm more than the height of the candle you wish to make. Next, place the wick at one end of the beeswax sheet. Use your fingers to gently press the wick into the beeswax sheet. Slowly, begin to roll the wax sheet using the warmth of your hands to mold the wax as you go. Be sure to keep the roll straight so your candle will be level. If desired, add additional sheets of beeswax to your candle by aligning the new sheet where the old sheet has left off. Continue rolling the wax sheets until you have the desired width of your candle. Burn candles under adult supervision only. Burn candles on a stable, heat-resistant surface and within sight. Keep away from vents, ceiling fans, and drafts. Extinguish candles if they smoke, if the flame becomes too high, or if they flicker repeatedly. Burn candles in a well-ventilated area. Easy Valentine Treats Kids Can Make — Delicious and simple treats made with just three ingredients! DIY Duct Tape Pencil Case with Zip Top — Beautiful and easy to make for school, work, or travel. Rock Cactus Garden — A fun and whimsical gift of a “plant” that never dies! Grandparent Gift Idea Kids Can Make — Create special memories together all year long with this simple gift idea. Newspaper Frame — Recycle old newspaper to make a personalized gift that will be treasured with this fun tutorial from Red Ted Art!